Epiphanius records in his Panarion that Marcion was born the son of a bishop in Pontus. Rhodo and Tertullian, young men in Marcion's old age, described him as a "mariner" and a "ship-master," respectively. Marcion made a donation of 200,000 sesterces to the Church in Rome. Conflicts with the Church of Rome arose and he was eventually excommunicated, his donation being returned to him. After his excommunication, he returned to Asia Minor, where he continued to lead his many church congregations and teach the Gospel of Marcion. Study of the Hebrew scriptures, along with received writings circulating in the nascent Church, led Marcion to conclude that many of the teachings of Jesus were incompatible with the actions of Yahweh, the belligerent god of the Hebrew Bible. Marcion responded by developing a ditheistic system of belief around the year 144. This notion of two gods—a higher transcendent one and a lower world creator and ruler—allowed Marcion to reconcile his perceived contradictions between Christian Old Covenant theology and the Gospel message proclaimed by the New Testament. In contrast to other leaders of the nascent Christian Church, however, Marcion declared that Christianity was in complete discontinuity with Judaism and entirely opposed to the Tanakh. Marcion did not claim that the Jewish scriptures were false. Instead, he asserted that they were to be read in an absolutely literal manner, thereby developing an understanding that Yahweh was not the same god spoken of by Jesus. For example, Marcion argued that the Genesis account of Yahweh walking through the Garden of Eden asking where Adam was, had proved Yahweh inhabited a physical body and was without universal knowledge, attributes wholly incompatible with the Heavenly Father professed by Jesus. According to Marcion, the god of the Old Testament, whom he called the Demiurge, the creator of the material universe, is a jealous tribal deity of the Jews, whose law represents legalistic reciprocal justice and who punishes mankind for its sins through suffering and death. In contrast, the god that Jesus professed is an altogether different being, a universal god of compassion and love who looks upon humanity with benevolence and mercy. Marcion also produced his Antitheses, contrasting the Demiurge of the Old Testament with the Heavenly Father of the New Testament. Marcion was the first to introduce an early Christian canon. His canon consisted of only eleven books, grouped into two sections: the Evangelikon, based on Luke with parts removed that did not agree with his views, and the Apostolikon, a selection of ten epistles of Paul the Apostle (also altered to fit his views), whom Marcion considered the correct interpreter and transmitter of Jesus' teachings. The gospel used by Marcion does not contain elements relating to Jesus' birth and childhood, although it does contain some elements of Judaism, and material challenging Marcion's ditheism. However, Marcionism conceptualizes God in a way which cannot be reconciled with broader Gnostic thought. For Gnostics, some human beings are born with a small piece of God's soul lodged within his/her spirit (akin to the notion of a Divine Spark). God is thus intimately connected to and part of his creation. Salvation lies in turning away from the physical world (which Gnostics regard as an illusion) and embracing the godlike qualities within yourself. Marcion, by contrast, held that the Heavenly Father (the father of Jesus Christ) of Marcionism was an utterly alien god; he had no part in making the world, nor any connection with it. In hindsight, Marcion is seen as one of the first heresiarchs for his deviations from what would become the orthodox positions of the main authorities in the Catholic Church. The suppression of the Marcionist form of Christianity is thus viewed as a catalyst for the development of the New Testament canon, the establishment of a centralized church law, and the structuring of the Church. The church centered on the Marcionist interpretation of the Christian gospel expanded greatly within Marcion's lifetime, became a rival to the orthodox Christian Church and retained its following for several centuries. It survived Christian controversy, and imperial disapproval, for several centuries more. Marcion proposed and delineated a canon (a list of officially sanctioned religious works). 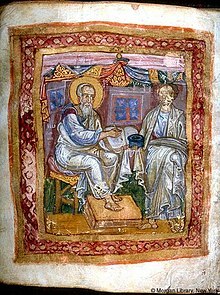 This prompted the orthodox part of the Church to form a separate official canon of books that had been recognized as divinely inspired and authoritative. Christians began to divide texts into those that aligned with the "measuring stick" (Greek kanōn literally means "measuring stick") as being apostolic, authoritative, Christian writings (the works of the Old and New Testaments as we know them today), those that were rejected as heretical or pseudonymous, and those that were accepted but not seen as canon or read in public gatherings (e.g., The Shepherd of Hermas). Therefore, Marcion played a role in finalizing the structure and contents of the collection of works now called the New Testament. ^ Harnack, Adolf. Marcion: The Gospel of the Alien God. Grand Rapids: Baker. p. 17. ISBN 978-1-55635-703-9. ^ Harnack, Adolf. Marcion: The Gospel of the Alien God. Grand Rapids: Baker. p. 18. ISBN 978-1-55635-703-9. ^ Refutation of All Heresies, XLII, ii. ^ The Prescription Against Heretics 30:3. Tertullian.org. ^ 115 years and 6 months from the Crucifixion, according to Tertullian's reckoning in Adversus Marcionem, xv. ^ a b Robert J. Wilkinson (5 February 2015). Tetragrammaton: Western Christians and the Hebrew Name of God: From the Beginnings to the Seventeenth Century. BRILL. pp. 120–. ISBN 978-90-04-28817-1. Grant, Robert M. Marcion and the Critical Method Peter Richardson & John Collidge Hurd, eds., From Jesus to Paul. Studies in Honour of Francis Wright Beare. Waterloo, ON, 1984. pp. 207–215.